We already know that Lightning McQueen’s Racing Academy will begin offering shows on March 31, 2018. Today, we’ve heard that DJ, the rockin’ blue car will bring his mix of beats to Sunset Showcase as well! 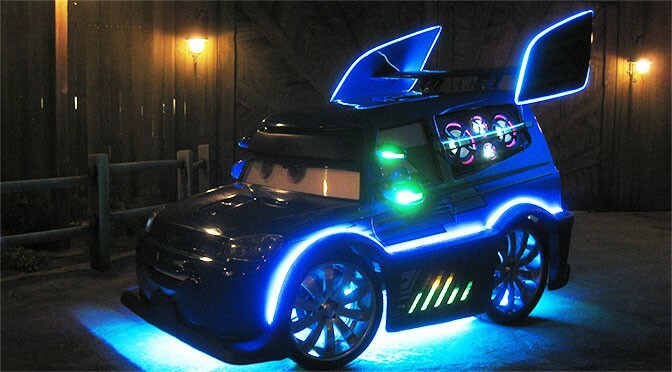 Multiple times per day DJ will appear in the Sunset Showcase Courtyard to lead a great cars themed dance party. DJ used to hold a similar dance party in Disney California Adventure at Radiator Springs. It was called DJ’s Dance and Drive. His pit crew will take the place of the the dancing waitresses. It should be a fun time for kids of all ages! I’ve added the schedule for DJ’s Ready! Set! Party Time to Character Locator. My son will be insanely excited about this!! Thanks for the info, Kenny! I had no idea this was coming.